Kudos to grocery giant Kroger, for pioneering a food ranking system to help it’s customers make wise decisions. The system ranks foods on a scale of 1- 100, from the least nutritious to the healthiest. The system, licensed from NuVal LLC, employs a system designed by experts from Yale University. It takes the information from food’s nutrition labels, as well as other public information to calculate it against the federal dietary recommendations. While these scores are much more factual and accurate than the failed food labeling system which put a green check mark on certain foods produced by their paid subscribers, there is still a controversy among purveyors. For example, General Mills Cheerios scored a rank of 37, while Post’s Shredded Wheats received a 91. The General Mills spokesperson, felt that the ranking was unfair, citing that the cereal was low fat, cholesterol free and made primarily of whole- grain oats. The NuVal spokesman stated that the Cheerios had more sodium and less fiber than the Shredded Wheats, justifying its data. NuVal does not show the scores to anyone before they appear on the grocer’s shelves, hopefully insuring that there are no outside factors affecting the scores. Consumers are responding to the information, and making healthier choices within each food group. This is just one step in a nation wide effort to help people make educated decisions in their food purchases. Walmart, the largest food retailer in America will be rolling out a similar program this year. Marc Jacobs is probably, indisputably the greatest fashion genius in our midst today. He is not only responsible for his eponymous Marc Jacobs collection, but also for the Marc by Marc Jacobs lines for men and women, and the ever exquisite Louis Vuitton collections for men and women. Not to mention the covetable shoes and handbags sold under all 3 labels. With that much to do, he deserves a tiny little slip once in awhile. So this addition’s lapse in sartorial taste features a look from Mr. Jacobs Fall 2010 collection under his own name. What suburban housewife hasn’t seen this one on the embarrassed Mom who got caught doing morning school drop off with her coat tossed over her nightgown, hovering in the car, hoping to go unnoticed? I mean, this can’t be a good look on anyone, can it? BTW, we in New York CIty are not immune to bad “taking the kids to school ” looks. Since we don’t have cars, they tend to be gym clothes, no makeup and a less than fresh ponytail. I just realized that Indigo Jones had a birthday and I missed it!!! Last year, on July 14,2009, we typed our first post. It’s all been a great experiment since then…writing about whatever moved us, and trying to keep up with all of you while life threw us curve balls. So, one year , 126 posts and 102 comments later, here we are. Thanks for sharing this journey with us. Stay tuned for more food, fashion, family,fitness and life. It’s been a great year! We thought the KFC Double Down sandwich was as over the top as you could get. Now we get word of 2 others that make it sound down right healthy!!! 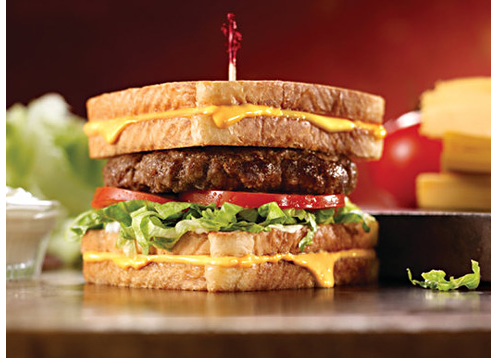 Friendly’s introduced it’s towering concoction called the “Grilled Cheese BurgerMelt” that combines many a sinful sandwich treat in one giant artery clogging entrée. The sandwich consists of a Black Angus beef burger, placed between 2 grilled (processed we’re sure) cheese sandwiches on white bread. Compared to the Double Down, which KFC claims is only 540 calories, 32 grams of fat and 1,380 mg. of sodium, the new offering weighs in at a staggering 1,500 calories, 79 grams of fat and 2,090 mg. of sodium!!! But don’t blame the American diet on all of this junk food nonsense. Just across the pond in England, food giant Tesco introduced this whopper…. The lasagna sandwich! The supermarket chain claims this “limited edition”(thank goodness!!!) carb- fest is a ‘healthy option” for a snack. The “Lasandwich” touts bread stuffed with noodles and a meaty tomato sauce with creamy cheddar, ricotta and mayonnaise . The original nutritional information on the packet stated 87 calories and 4.1 grams of fat. (per bite?). The reality, is that it contains 565 calories, and 26.9 grams of fat. 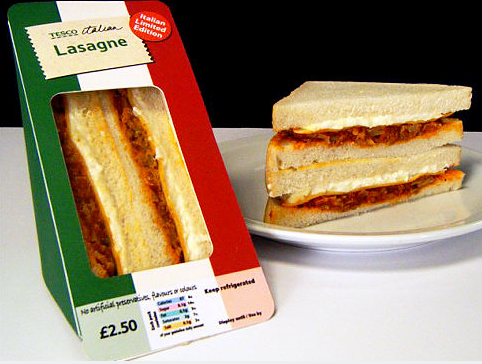 One Tesco lasagna sandwich is the equivalent of two Mc Donald’s cheeseburgers, which add up to 595 calories and 24 grams of fat. Still a snack, compared to the Friendly’s offering we suppose, but a travesty just the same. I have written about Jen and her wonderful organization “Cycle for Survival” several times on this blog. Recently, she has been honored as one of the finalists in the “Energizer Hall of Fame”. A six time survivor of a rare form of cancer, Jen is currently waging yet another battle. Throughout her fight she has shown immense courage and fortitude that puts that Energizer Bunny to shame! Please take a moment to cast your vote for Jen. The winner gets a donation to the charity of their choice. Please click on the link to view a video from Jen and cast your vote! Energizer Hall of Fame. Trendy retailer Abercrombie & Fitch were forced to close two Manhattan stores this week, due to a bed bug infestation. The Hollister store in New York’s Soho area was closed for 3 days, and the South Street Seaport outpost of Abercrombie closed yesterday. Bedbugs, it seems are nocturnal creatures, and the dark clubby environment of the shops are prime breeding ground for the insects, with lots of clothing for them to snuggle up in. The problem is, that they are tiny and hard to detect. They travel easily in clothing and handbags, and have no qualms about making themselves at home in new locations. Like their friends head lice, it is about transmission, not cleanliness, and they are very difficult to get rid of. Abercrombie has stated that they will take back any purchases, and quarantine them before returning them to their headquarters in Ohio. This may help them avoid further inter-company spread, but if someone brought them home, they are probably already infested. I shudder to think about the other stores and offices in the area where they might have been taken inadvertently. The possibilities of a mass outbreak in New York are unfathomable. 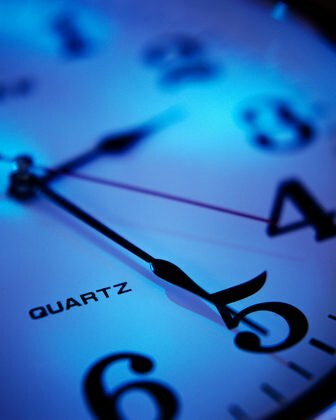 Should you see signs of bedbugs, call an exterminator immediately. Do not take your clothing to a friend’s home or hotel unless it has just been washed and dried at high heat and put into a sealed plastic bag immediately. British street artist Luke Jerram has placed 60 pianos in 50 locations around New York City in an effort to build a sense of community and provide local entertainment. The pianos are positioned in various sites in Manhattan, such as Lincoln Center, the Staten Island Ferry terminal and the Central Park band shell. On a recent Friday evening in Greenwich Village’s Washington Square Park, an ad hoc group formed, with local guitarists, a drummer and some singers accompanying the very talented pianist. A crowd gathered, and was singing and dancing along with the music. At one point, a Michael Jackson impersonator joined in and moonwalked along to the music. Mr. Jerram has placed 130 pianos around the world since he started this project in 2008, including London, Sydney and Sao Paulo. He has had over 40 requests from other cities in the first week that the pianos were placed in New York City. According to Jerram, the pianos are a blank canvas for everyone’s creativity. If last weekend in Washington Square is any indication, I’d say it’s working.